Pallotta TeamWorks is a charity event production company that runs bike races and other events. In 2002, they had grown out of their existing offices and needed more space, which they found in a large warehouse in the Atwater Village area of Los Angeles. The event company contracted Clive Wilkinson Architects to come up with a solution for creating an inspiring new headquarters inside the warehouse on a tight budget. The result is a shipping container city topped with tents that are reminiscent of the very events that Pallotta sets up. Pallotta TeamWorks found a good deal on the warehouse, but after running the numbers realized they wouldn’t be able to afford keeping the entire space air-conditioned — plus, they were working on a budget to build out the office. Clive Wilkinson Architects, who had come up with other creative solutions for warehouse spaces, conceived the idea to use shipping containers and large tents to create “breathing islands” inside the warehouse. These self-contained air-conditioned islands of activity provide space for each department within the company and gives them each an identity, and it also takes visual cues from the charity events and races the company produces. The large white circus tents are anchored to the floor by shipping containers and narrow “streets” connect each department together in a mini-city, while a larger container tower (three tall), serves as the “executive tower”. Skylights from the warehouse roof bring in natural daylight to the space, while the tents minimize the volume of space that needs to be air-conditioned. Raw lumber is used throughout the project for desks, walls, partitions and other built-out designs. Bright colors, map tables, and even river rock water fountains decorate the space and serve as inspiration for employees. 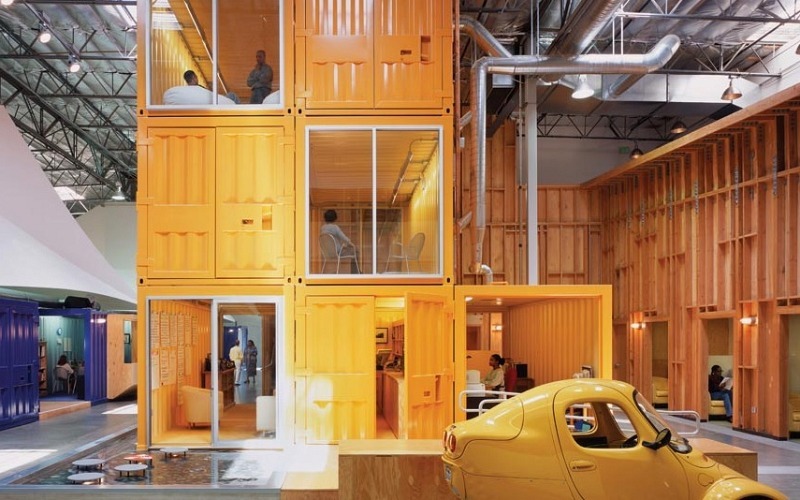 Clive Wilkinson’s design for the Pallotta TeamWorks headquarters received a design award from the AIA in 2002 for creating a lively work environment in a warehouse with reduced energy usage despite a low construction budget. Clive Wilkinson Architects have built out creative solutions for warehouses in the past. They were chosen by Pallotta to create an inspiring headquarters on a tight budget. Clive Wilkinson chose to use shipping containers and white tents to create "breathing islands" for each department in order to minimize the volume of air-conditioned space. Streets are naturally created between the islands, resulting in a tent city reminiscent of the charity events and races that Pallotta produces. Map tables, brightly colored walls, fountains, and lots of open space create an inspiring place to work. Skylights from the warehouse bring natural light into the space to reduce the need for artificial lighting. Clive Wilkinson's design for the Pallotta TeamWorks headquarters received a design award from the AIA in 2002 for creating a lively, energy-efficient warehouse work environment despite a low construction budget.